Comfortable rural village house with wifi, beamed ceilings, tiled floors and ornamental ironwork set just below the castle on the very edge of the village overlooking the river gorge to the cork-oak clad slopes of the Alcornocales Park beyond. It has a wide terrace, colourful creeper covered patio and secluded garden with swimming pool beyond. The pool logia is an ideal place to relax in even in winter. Jimena is well stocked with food shops, good tapas bars and restaurants. It has an excellent fully staffed Health Centre. Its many musical events include an International Music Festival in July. The coast is half an hour distant, Gibraltar airport one hour and Malaga two hours. It is within easy reach of many famous historic towns such as Ronda, Arcos, Jerez, Cadiz, Seville, Cordoba and Granada and it is less than an hour by boat across the strats to mysterious Morocco. The whole area is one of outstanding natural beauty. Jimena is on the edge of the Alcornocales Natural Park Nature reserve. It is a particularly good area for wild flowers in Spring and for birds. Jean Sassoon is a retired archaeologist and anthropologist who worked in east and north eastern Africa for twenty years.Since then she has explored extensively in southern Spain and is therefore very knowledgeable about the local area, its history, archaeology botany etc. This old house has a lovely friendly, comfortable family atmosphere about it as though the poeple who lived in it over the years were happy there and really loved it. It is in a small street of very friendly and nice people. One of the few houses in the village that has not been transformed with shiny tiles and imitation leather furniture. The third lavatory/washroom in the hall is very convenient when the house is full. Full of light and with views over the river valley. Downstairs are two twin bedrooms each with its own colourful bathroom, a small study-bedroom which opens onto the patio, a utility room with two sinks and washing machine and the hall with a separate WC. On the first floor the comfortable open-plan kitchen/dining/sitting room with open fire gives onto the wide partly creeper-covered terrace with views over the mountains. The house is provided with electric radiators, gas fires and electric fans. There are original paintings throughout the house. The pool is 4x5x1.40 metres with a most attractive rustic loggia behind it. It looks straight onto the mountains. Children are welcome and many toddlers have stayed in the house but those with toddlers should be aware that the stairs are open. A nice House in a great location, if you like as we do local experiences rather than traditional British Costa holiday. Great Tapas bars in easy walking distance , Good Quality Restaurants within 5 minutes drive. Beautiful and charming house. Lovely surroundings and peaceful. Thank you. It is a comfortable old village house with a nice feeling of having been lived in by happy families. The upstairs open plan kitchen, dining room, lounge is nice and leads out onto the terrace with views to the mountains beyond. There are lots of books and the kitchen is well equiped although some of the fixtures and fittings have seen slightly better days and the view would be improved by lopping the tree halfway down the garden. Downstairs the beds are comfortable - at least in the room with blue bed covers that we used. There is a lot of information and leaflets about local sights and walks and Jean was very helpful advising us. We visited: the nearby Rio Hozgarganta; the Cueva de Pileta (prehistoric cave paintings); el Chorreon de las Naranjas waterfall (quite a long walk); Ronda (lots to see there) and the beach at Alcaidesa (just up the coast from Gibraltar. We got some local colour when a group of singers gathered outside the house to serenade a wedding party coming out of the house opposite and I also enjoyed the wind band mostly comprised of young people playing next to the route of a local race to support the runners. The sunbathing area next to the pool is not overlooked and the pool was good to cool off in. When we were there there were lots of roses in bloom. More shopping and a post office is in the town centre. A car was very useful but if you don't have one there is a station at Los Angeles 2 or 3 km away. The trains are not very frequent but they do offer an alternative way to get into the area. Rather overdue with my review but could not forget our wonderful time in this charming house in one of my favourite destinations. La Mora was perfect for a relaxing, self-catering stay in Jimena and Jean was really kind and helpful. The house and outdoor areas are gorgeous and had everything we could possibly need. We spent a lot of time on the terrace and by the pool, enjoying the tranquility and the splendid view, and also made good use of the kitchen and dining area, having friends over for dinner which was nice to be able to do. Great sleeps too. The only downside was having to stop pretending that we lived there and come back to reality! Our family stayed at La Mora.. two adults and two boys age 6 & 2 and we loved it here. The house is so authentic and comfortable..especially the upstairs with the balcony looking down to the pool. The boys loved the pool and spent hours in there and with such lovely views behind its an extremely relaxing place to be. Two lovely sized bedrooms and bathrooms, good amenities with washer etc. The property was spotlessly clean and the neighbours were friendly. Jean is very helpful and we have recommended this house to our friends. We will definately be back next year! we have just returned from La Mora, after a very pleasent 2 week stay. The house is lovely, 2 large bedrooms and bathrooms downstairs and a very comfortable lounge etc. upstairs all beautifully clean. but we lived on the patio or by the pool when "at home". The village has a number of bars and restaurants all within walking distance. 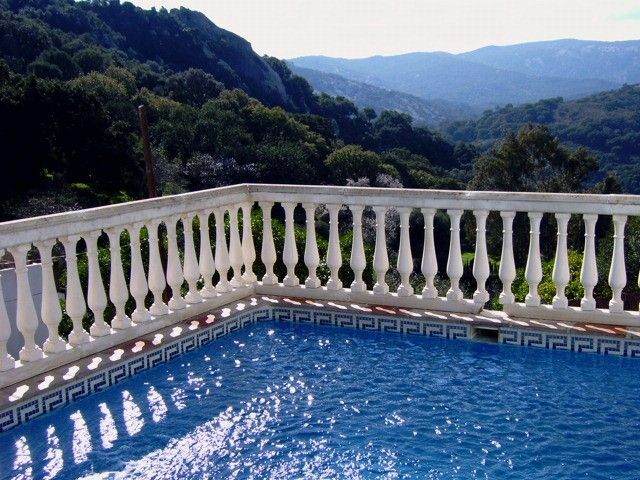 The surrounding area is delightful from the unspoilt river to the lovely cork oak forests. Andalucia and La Mora are great and Jean, the owner, is very helpful. Golf: THe famous Valderrama golf course is only half an hour away and there are several more golf courses in the vicinity. Ski: Skii-ing in the Sierra Nevada is sufficiently distant to require a night away.